10 minute PizzaToday I show you how to make a quick and easy pizza that tastes great. This is a fast way to have a hot lunch on the table in less than 15 minutes. Best of all, it is plant based vegan and is a great way to use up any leftovers you have in your fridge. Just use some pita bread or Lebanese bread as the base and you will be done in just minutes 🙂 My favorite is middle eastern pizza with hummus and falafels... but any toppings works fine. 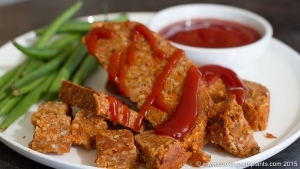 Black Bean & Potato Seitan RoastThis black bean and potato seitan roast recipe is extremely hearty and filling, ideal for hungry families in need of comfort food! Best served with a mushroom or brown onion gravy with a some baked vegetable sides! Cheaters Pea and Mushroom RisottoThis cheaters mushroom risotto is ready in less than 15 minutes and you will love the rich and creamy flavors! No need to stir for an hour and perfect for a quick lunch or dinner. 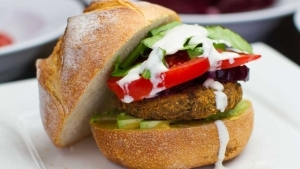 Vegan Chickpea & Potato Burger PattiesThese baked chickpea and potato burger patties are super tasty on their own, with a side of salad or loaded onto a bun with all of your favorite burger toppings. 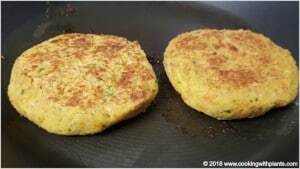 It is a softer style burger patty and is perfect for those watching their weight... it has no oil and is a tasty whole food plant based recipe. Creamy Avocado Cashew Pesto SpaghettiThis no oil Avocado Cashew Pesto Spaghetti is a real crowd pleaser. So easy to make and tastes aboslutely amazing! Best of all it is dairy free and 100% plant based! 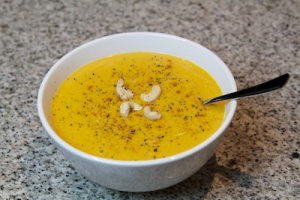 Creamy Butternut Pumpkin Soup - dairy Free!This creamy pumpkin soup is like silk in a bowl... smooth and tasty - without dairy or cream 🙂 The luscious texture is created by adding blended cashew nuts at the end of the recipe! YUM!!!! This is a family favorite of ours, and I hope you will enjoy it as much as we do. 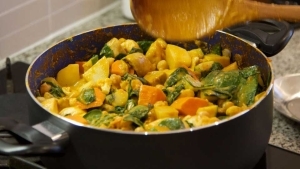 Creamy Vegetable CurryThis creamy vegetable curry is a mouthwatering taste sensation! With a simple home made curry paste, the fresh flavors are super tasty. Great served with rice, quinoa or cauliflower rice! Curried Singapore Rice NoodlesToday I show you how to make quick and tasty curried Singapore rice noodles using no oil and only healthy and delicious ingredients. This is a perfect dish to make when you are short on time but feel like a hot meal. It is also ideal to make ahead of time and pack into your lunchbox for work or school. 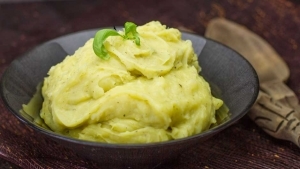 Dairy Free Herbed Mashed PotatoesThis is a super easy vegan recipe with no added fat - so it is great for anyone following the starch solution (dr john mcdougall) or raw till 4 etc. It is rich, creamy, full of flavor and totally healthy! Best of all it is 100% dairy free plant based vegan with no cholesterol. 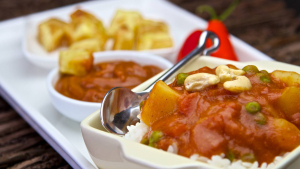 Easy 5 minute Curry SauceSome curry sauces take hours of preparation and cooking to achieve their flavour. This curry sauce recipe is just the opposite. Perfect for those week nights where you come home tired and worn out. 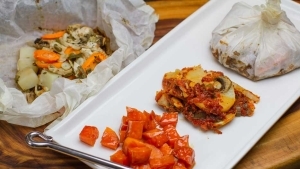 Baked Vegetable ParcelsThis is much more of a guide than a recipe. In this latest video I really wanted to show how easy it can be to take some vegetables and combine them with whatever herbs, spices and condiments you have on hand and turn them into super tasty! It's perfect for both adults and children alike and can be served as a quick meal or as a gourmet addition to any fancy feast! Gluten-Free Vegan Peanut Chickpea BurgersThis gluten-free vegan burger recipe is one of my all-time favorites. It's easy to make, tastes amazing and holds up well in a pan, oven or grill! Full of flavor and healthy goodness, the mixture of peanuts and chickpeas makes this is a great meat free hamburger to serve to both carnivores and plant eaters alike. Kids also love these 🙂 This is a super easy recipe to follow and make right at home in your kitchen... meat free, mouth watering and healthy. Enjoy! Hearty Mushroom Lentil BurgerThis meatless burger recipe is so tasty that you will not believe it is meatless! Full of flavor and healthy goodness, this is a great meat free hamburger to serve to both carnivores and plant eaters alike. Kids also love these 🙂 This is a super easy recipe to follow and make right at home in your kitchen... meat free, mouth watering and healthy.